Youth groups from within Burnett County have a priority reservation period from January 1-March 31, in which to make one reservation. Beginning April 1, family groups & out-of-county youth groups may call for reservations; and Burnett County Youth Groups may call for additional reservations. All groups/families are limited to two reservation periods per season. These reservations are on a first-come first-served basis. A non-refundable reservation fee will be due within 5 business days from the time the reservation is made and can be mailed to the Forest & Parks Department at 8150 State Road 70, Siren, WI 54872; if not received, dates will be open to others. Reservations cannot be made before the calendar year of intended use. Reservations for dances are not accepted. The maximum session length per group of campers is three nights and days. Overnight camp capacity is 64 campers. All youth groups and family groups must sign the Camp Burnett Youth Camp Agreement Form which includes the policies enforced under the Burnett County Land Recreational Ordinance. Follow this link to view the policy. For information on group rates or information about overnight stays at Camp Burnett, visit Lodge and Cabin Rates or Day Use (Lodge Only) Group Rates located here on our website. 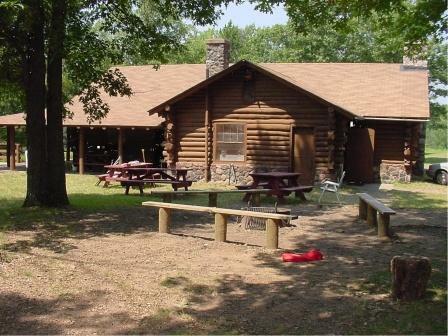 Camp Burnett is located at 30319 Eliot Johnson Road on the east shore of 26 Lake on the Burnett County Forest Lands, seven miles east of Danbury. The camp consists of a log lodge, seven cabins with bunk beds, and sanitary facilities. A deck and staircase lead to a small sand beach. All of the log buildings were constructed by the WPA and were dedicated to the county on June 21, 1942. For answers to frequently asked questions, please follow this link.